STREAM programming has been integrated into all our programs from Pre-Kindergarten to Grade 8. 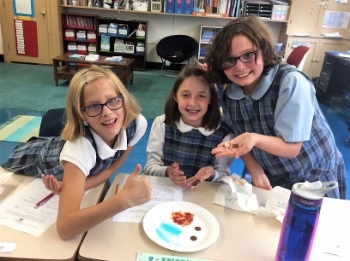 A broadening of STEM learning—which intentionally incorporates Science, Technology, Engineering and Math across the curriculum—STREAM uniquely includes the Arts and Religion into its repertoire. 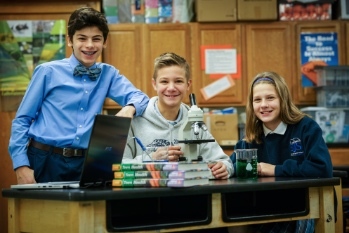 As a Catholic school, our mission is to education the whole child—mind, body, and spirit. STREAM enables our faculty to continue to raise the bar, allowing our graduates to distinguish themselves and to outperform their peers! The STREAM learning model was adopted in order for our school community to completely immerse itself across curriculum and departments into an innovative, instructional model. It uses an interdisciplinary approach—combining two or more subject areas—to create a bridge between them thereby deepening students’ learning. Moreover, STREAM education speaks to best practices for both educators and students. A greater emphasis is placed on teaching 21st century skills like creative and critical thinking. Students and parents may expect more project based learning occurring right in our dynamic classrooms. STREAM is not new curriculum, but rather a new mindset of teaching our students. St. John’s has committed to this program as evidenced by the significant acquisition of equipment and technology, as well as extensive faculty training. Comprehensive science kits that encourage hands-on, problem based learning, sets of Chromebooks for student use in classrooms, robotics kits, and video production equipment all promote technology-driven, engaging, and purposeful STREAM integration. The goal is not to just use technology for the sake of using it, but to integrate it as a tool to enhance learning. For example, when 6th graders study ancient Egypt, they may take a virtual tour within the Pyramids at Giza or view excavation projects in real-time. Beyond learning from a textbook, our STREAM approach allows academic concepts to be explored with real life applications and experiences to develop a deeper understanding. In the real world, problems faced and the solutions to resolve them are rarely approached in isolation; rather, understanding the issue deeply and drawing upon many disciplines and experiences often make for the most effective solutions. The STREAM learning model promotes this collaborative method. Mrs. Mary Makar has been appointed as the school’s STREAM coordinator, acting as a liaison between St. John’s and the greater community, including the Education Department at the Diocese and other Catholic schools across WNY. To contact Mrs. Makar, email her at mmakar@stjohnskenmore.com. Click here for additional information regarding our STREAM Academies & More.